Our three kettles have built in analog dial thermometers (called 'BrewMometers') and we also added good quality electrical RTD temperature probes for our PID controllers. 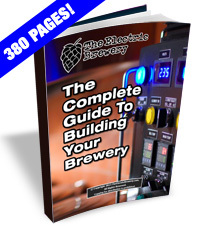 There are various times during the brewing process, however, where we need to take temperature readings outside of the kettles (such as when taking sparge samples or after chilling the wort). We use a waterproof digital probe thermometer to do this. Below are three choices based on budget. The major difference between the units is mostly read time and accuracy. All are waterproof (an absolute requirement in our eyes). Most of the non-waterproof digital probe thermometers that we've used in the past simply don't last. Regardless of how careful you are, eventually water gets in and the unit stops working reliably. If the digital probe thermometer is accurate enough (such as the ThermaPen) it can also be used to calibrate the RTD temperature probes. 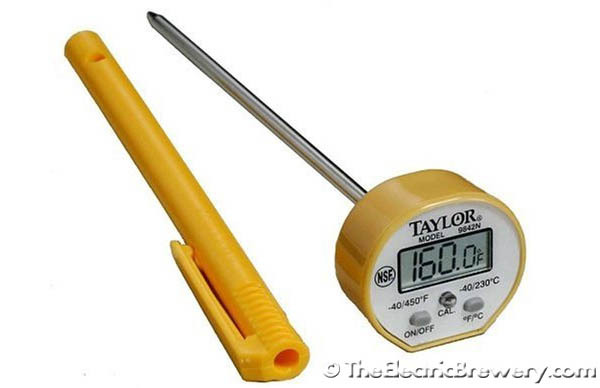 On the low end we recommend the Taylor 9842 Commercial Waterproof Digital Thermometer. It works from -40 to 450F, has an auto shut-off feature, a calibration knob, and (most importantly) is completely waterproof. It's a bit on the slow side, as it can take up to 10 seconds or more to take a reading. A better digital probe thermometer that reads slightly faster is the ThermoWorks RT600C Super-Fast Water-Resistant Digital Pocket Thermometer. It is (in our opinion) more 'commercial' grade and resilient than the Taylor 9842 even though the Taylor has the (somewhat meaningless) word 'commercial' right in the product name and the ThermoWorks does not (that's marketing at work for you). It takes up to 5-6 seconds to take a reading so it's about twice as fast as the Taylor 9842. 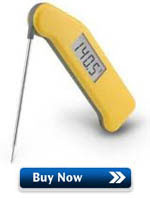 On the high end we have the ThermoWorks ThermaPen. This is the thermometer we recommend and use ourselves in our brewery. We also use a second one in the kitchen and for barbecuing. These precision thermometers are made by hand in Worthing England by the family run company Electronic Temperature Instruments, Ltd. The Thermoworks fold-away probe allows it to fit more easily into your pocket than conventional probe thermometers and also helps protect the probe. No exposed buttons or switches (the seldom used ones are in the battery compartment and the unit automatically turns off when you fold away the probe). It is more accurate than the above thermometers as it has 2-point calibration instead of 1-point (you can set both the temperature offset and the linearity instead of just an offset so it will read more accurately over a wide temperature range). It takes less than 3 seconds to take a reading so it is almost twice as fast as the ThermoWorks RT600C. It even comes with a NIST (National Institute of Standards and Technology) certificate of calibration showing the test results of the actual thermometer you purchased. 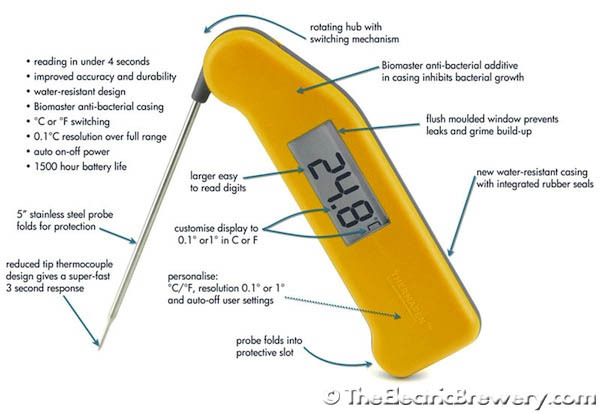 Brewers (and others) who use the ThermaPen swear by it. It's used a lot in the cooking industry by both chefs and health inspectors alike. We've thrown out many cheap digital grocery store thermometers over the years, enough that we could have simply purchased a ThermaPen right from the start and been done with. It would have saved us money in the long run. Live and learn. As the old saying goes: 'Buy the best and you only cry once'. The three thermometers mentioned here can be calibrated. You'll most likely have to adjust the offset on the Taylor 9842. The offset on the ThermoWorks RT600C may require calibration. The ThermoWorks ThermaPen with its NIST certificate and advanced factory calibration will most certainly require no adjustment at all. To calibrate a probe thermometer, follow the supplied instructions. Generally speaking it usually goes something like this: Fill an insulated container (such as a Thermos) with a mixture of crushed ice and water. 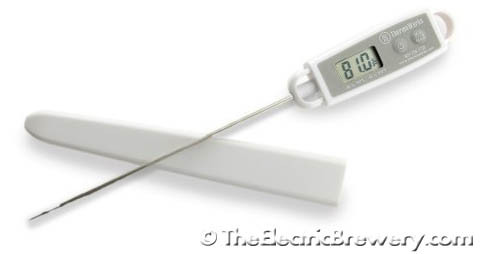 Wait 4-5 minutes then insert the thermometer such that the probe is submersed and away from the edges. Wait until the reading stabilizes and then adjust the calibration screw if the reading does not read exactly 32F. The ThermoWorks ThermaPen will include more advanced instructions as it has both a temperature offset and linearity adjustment.